Fortnite Season 8, Week 2 is here and with it a rather different spin on the usual ‘sight-seeing’ challenge. Instead of visiting named locations you’re asked to visit the furthest points of each coast. This means you need to go the northern, southern, eastern and western tips of the island, not the central cardinal point for each one. Put differently, you want to go the part of the coastline that extends furthest into the specified direction. This turns out to be a very specific spot on each coast, marked clearly by a sign. But this can also mean running and down the coast looking for it, as it’s not always obvious at a glance of the map which specific part of the coast it is. The northern point in circled in red, the southern in blue, the eastern in yellow and the western in purple. To receive credit for this challenge you just need to run into close proximity of a specifically marked sign. As mentioned earlier, not every coastline has their furthest point being directly centred, even if most of them are. The northernmost point is actually very heavily westward, just northeast of Junk Junction (so basically almost on the west coast), near the ‘sitcom’ film set. C3 on the main map’s grid. The southernmost point is centrally located near Lucky Landing. Just east of Lucky Landing is a sizeable hill that overlooks the ocean which houses the southern sign. You’ll find it at F10 on the main map’s grid. The easternmost point is also centrally located on its coast. If you recall the ‘superhero mansion’ (south of Lonely Lodge) from Season 4, there is a small jut of land just south of that now defunct mansion where you’ll find the eastern sign. Located at J6 on the main map’s grid. The westernmost point is located at Snobby Shores, a stone’s throw away from the snobby houses. A5 on the main map’s grid. That’s all there is to this challenge. You don’t need to visit each point in a separate match or any of that nonsense. That being said they’re so far apart you would probably struggle to get more than one or two done in a single match now that the Stormwing is decommissioned. 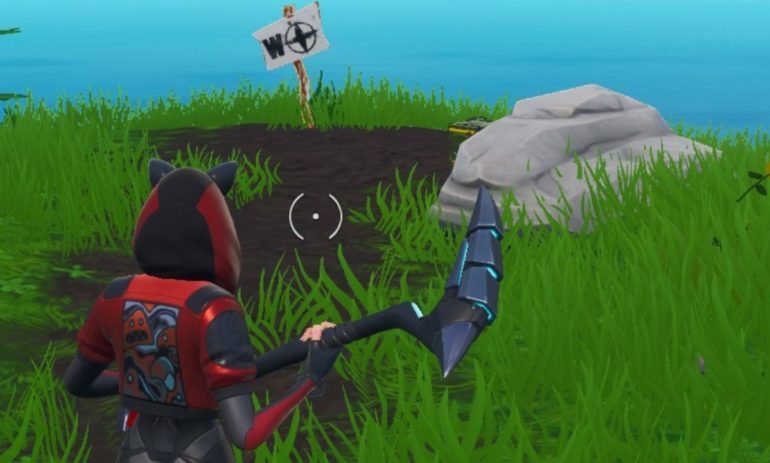 For those of you thinking that they can be cheeky and destroy the signs to confuse people trying to complete the challenge, you can’t.